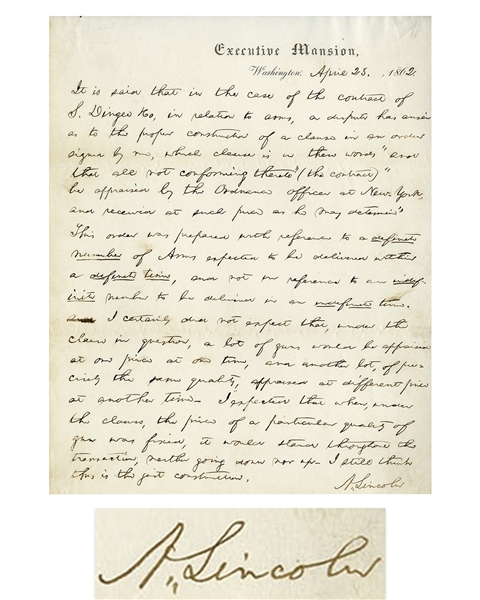 Abraham Lincoln autograph letter signed as President with exceptional content regarding arms requisitions, dated 23 April 1862 during the early years of the Civil War as the government's military expenditures were dramatically increasing. Lincoln's legal instincts are sharp here, as he analyzes a contract for the purchase of guns, putting a contractor on notice that varying prices will be challenged, and making sure that the government doesn't fall victim to war profiteering or fraud. Upon Executive Mansion stationery, Lincoln writes to an unnamed recipient, in full, ''It is said that in the case of the contract of S. Dingle & Co., in relation to arms, a dispute has arisen as to the proper construction of a clause in an order signed by me, which clause is in these words 'and that all not conforming thereto' (the contract) 'be appraised by the Ordinance officer at New York, and received at such place as he may determine.' This order was prepared with reference to a definite number of Arms expected to be delivered within a definite time, and not in reference to an indefinite number to be delivered in an indefinite time. I certainly did not expect that, under the clause in question, a lot of guns would be appraised at one price at one time, and another lot, of precisely the same quality, appraised at different prices at another time - I expected that when, under the clause, the price of a particular quality of gun was fixed, it would stand throughout the transaction, neither going down nor up - I still think this is the just construction. A. Lincoln''. 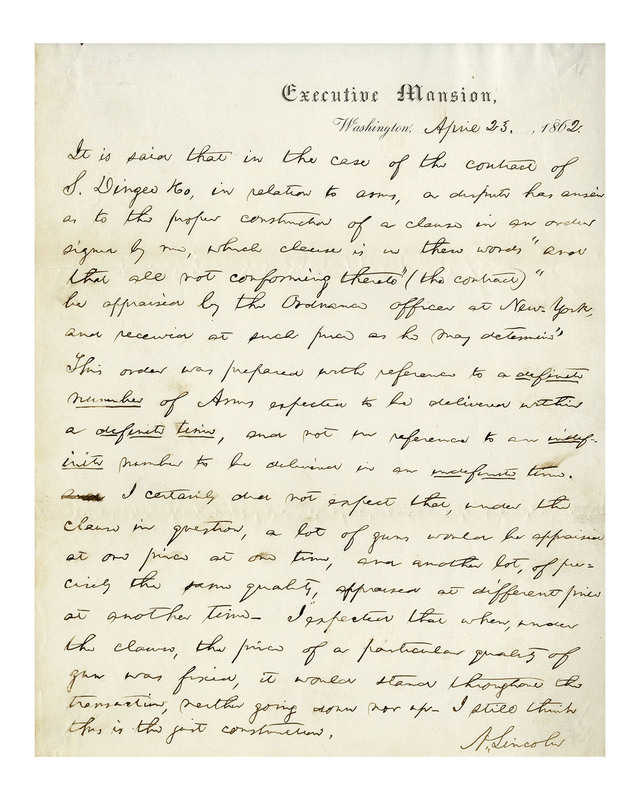 Single page document is excellent for display, with Lincoln's penmanship bold and legible. 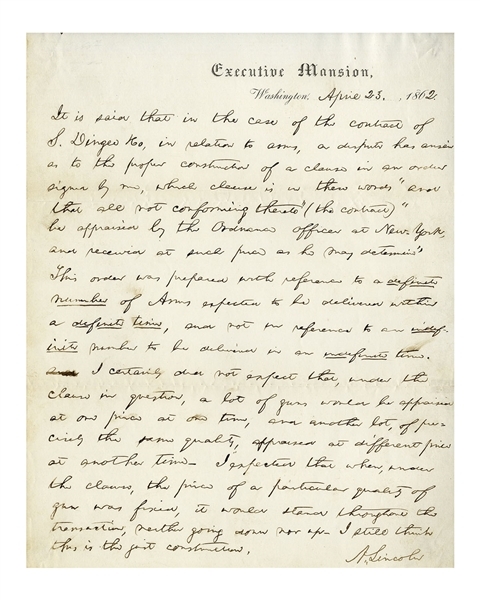 Page measures 8'' x 10'', with folds and small chip to upper left. Overall in very good to near fine condition.